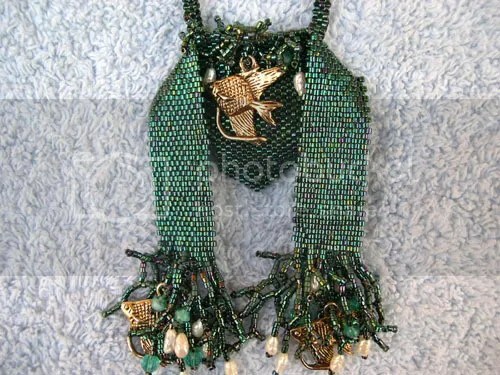 I used to do a lot of beadwork. I still love it, but seems like knitting has taken over my life lately. 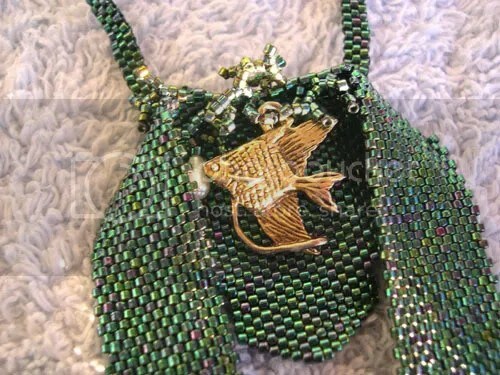 But back in the days when I was beading, this is the kind of thing I used to make. This is one of my first necklaces. I call it “Under The Sea”. 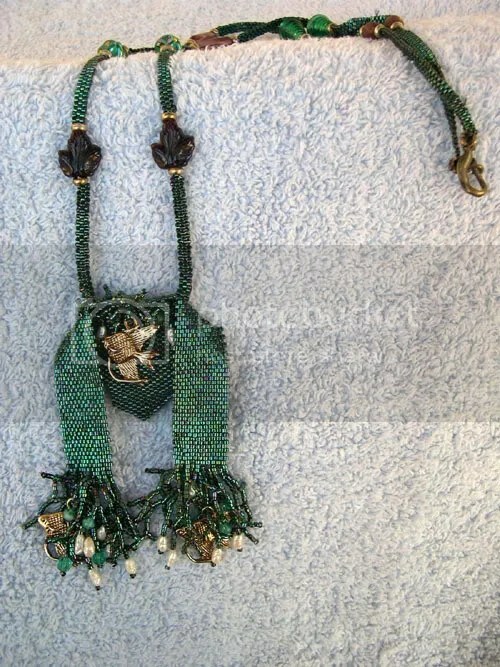 The original pattern, designed by my friend Linda C. Smith, was very different. I started out with the part in the middle, and then kinda took off and made up my own design. Do you still make those? Cause I would want to order one with dat fish. You know why….My daughta her going get married her said…I no see any blingbling on da ring finga but da plan is she going marry da guy. Good Comanche family ~ If/when she get married….guess what her last name would be….fo’real now dis his las name….YellowFish. Guess what my daughta name….Star, so her friends saying Star you going be StarFish. Funny yeah. 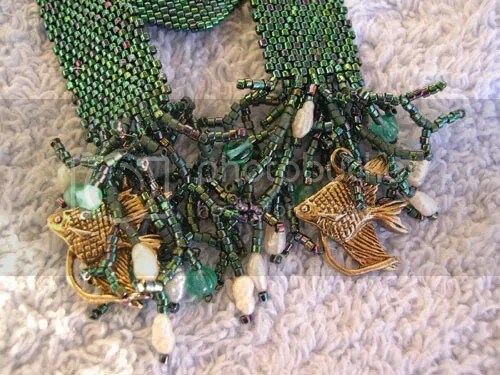 But dat necklace would look nice for powwow too. Oh & future SIL, da buggah does beadwork, mostly for his own regalia (powwow stuff), he makes his own fan. If you can make, email me let me know how much? If can can, if no can no can. I no take long time and you gotta have good makas fo’do beadwork. *L* I would be crosseyed. Eh girl, I going need yoa email addy! U not accepting emails at AW and I nomo yoa email. Try sendum again, k, at da Comcast addy. We talk about dis. Mahalo. U honor me.